This program is an example of using autofilters in a worksheet. See Working with Autofilters for more details. # An example of how to create autofilters with XlsxWriter. # simple criteria so that some data is shown and some is hidden. 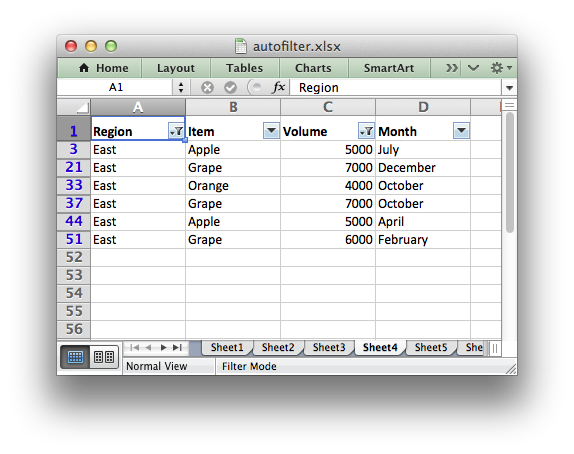 # Add a worksheet for each autofilter example. # Add a bold format for the headers. # Open a text file with autofilter example data. # Read the headers from the first line of the input file. # Read the text file and store the field data. # Split the input data based on whitespace. # Convert the number data from the text file. # Set up several sheets with the same data. # Make the columns wider. # Make the header row larger. # Make the headers bold. # Example 1. Autofilter without conditions. # Example 2. Autofilter with a filter condition in the first column. # Autofilter range using Row-Column notation. # Row matches the filter, no further action required. # Example 3. Autofilter with a dual filter condition in one of the columns. # Example 4. Autofilter with filter conditions in two columns. # Example 5. Autofilter with filter for blanks. # Create a blank cell in our test data. # Simulate a blank cell in the data. # Example 6. Autofilter with filter for non-blanks.